Friends and Heroes - fun resources for use with children's groups! Ideal for organisations, such as schools and churches, which are looking for quality material to excite, entertain, educate and inform the children they work with. This includes the DVDs, Lifetime Series Public Display Licence and access to lesson materials. Ideal for those who already own some DVDs but would like to use within their organisation, providing a Lifetime Series Public Display Licence and access to lesson materials. "It is really difficult to find books and video materials that engage boys but this has been outstanding. Thank you and God Bless!" JW, UK Prep School. A Lifetime Series 1 Public Display Licence and access to Lessons. A Lifetime Series 2 Public Display Licence and access to Lessons. A Lifetime Series 3 Public Display Licence and access to Lessons. This Holiday Bible Club provides all that you need for a week of fun, active and Biblical Holiday sessions. The Bible comes alive with this fun collection of puzzles, games and colouring pages based on the first series of our epic animated adventures. Save �5 when you buy this Pack of Ten Puzzle and Colouring books. The Bible comes alive with this fun collection of puzzles, games and colouring pages based on the second series of our epic animated adventures. 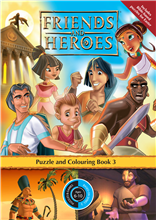 The Bible comes alive with this fun collection of puzzles, games and colouring pages based on the third series of our epic animated adventures. 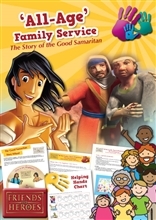 An award-winning, DVD-based family and group study resource for Easter. Any public showing of Friends and Heroes needs a Friends and Heroes Public Display Licence. Each Organisation Series Pack is a combination of a Family Pack with a Licence and Lessons pack. The licence included provides permission for public display of our DVDs which are otherwise only licensed for home viewing as they are not covered by any other licensing scheme such as CCLI. You also have permanent access to exciting lesson plans: the Bible lessons have been developed specially for church ministry and there are school lessons, covering key stage 1 (infants) and key stage 2 (juniors). Links to RE Curriculum areas are shown for England, Isle of Man, Northern Ireland, Scotland, Scotland Roman Catholic and Wales. You can also find Cross Curricular links for SEAL and Literacy.